The Snore Medic, not to be confused with SnoreMeds which is a similar product that I’ve reviewed in the past, is sold by the company Cures For Snores LLC., which is based out of Provo, Utah. The company was founded in 2014, although the Snore Medic website wasn’t registered until January 2016. 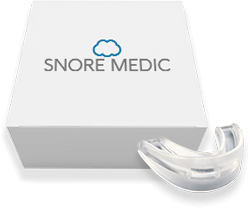 The Snore Medic is similar to other snoring mouthpieces that I have reviewed in the past. It’s a colorless, translucent, thermoplastic boil and bite style mandibular advancement device that features two holes at the front which allows air to pass freely. These holes can be viewed as one large breather hole that is separated by a small pillar in the middle. The Snore Medic comes with a retainer plug which should be inserted into the hole during the molding process and discarded afterward. In addition to the mouthpiece itself, the SnoreMedic also comes with a clamshell style plastic storage case that tightly snaps together with vent holes which is great for storage and transportation of the device. The package includes a small 8-page booklet which contains information such as the instructions for use, fitting instructions and procedure, contraindications, warnings, precautions, and cleaning instructions. All items are packaged inside of a square box for retail display. Overall, I was fairly impressed with the presentation of this product. In the past, I have come across some mouthpieces that were sold with no packaging, instructions, or storage case. Before discussing my experience with the Snore Medic, I’m going to go over some additional information that I found on this product. Snore Medic states that during sleep, the muscles of the upper airway relax, restricting airflow and causing the vibration that we know as snoring. The claim is that Snore Medic comfortably supports the jaw, keeping the airway open which eliminates noisy vibrations. This statement and claim concerning MAD’s are indeed true. Mandibular Advancement Devices such as the Snore Medic have been studied extensively over the past 30 years as a treatment for snoring and or sleep apnea. In this recently published study, it was found that 72% of patients achieved a satisfactory outcome when treating Obstructive Sleep Apnea (OSA) with a MAD. 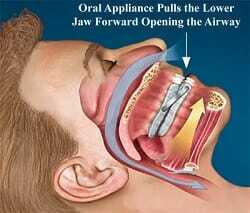 OSA and snoring are closely related as they both are a result of restricted airflow caused by relaxed upper airway muscles. There are nearly 100 such products on the market, many are available only by prescription. Despite the design or brand, every available mouthpiece performs the same function which is to hold the jaw forward and tighten the airway thereby eliminating snoring or in some cases OSA. The reality is that while all mouthpieces are the same mechanically, some have more features, fit better, and are more comfortable than others. If you are not familiar with snoring mouthguards, you may be a bit skeptical and wonder whether or not such a product will be a good fit for your snoring. Most reputable sellers will offer some sort of guarantee to encourage those who are on the fence about purchasing their product. According to their website, Snore Medic comes with a 30-day money back guarantee. Their refund policy states that you will need to obtain a return authorization RA in order to qualify for a refund. This must be obtained within 30 days of delivery, not necessarily 30 days from purchase. There is a simple return authorization request form on the website which makes this process simple. Unfortunately, shipping costs are non-refundable and you are responsible for the cost of return shipping, which should cost less than $5 when using the standard mail service offered by USPS. Total Cost of the Snore Medic – How Does it Compare? 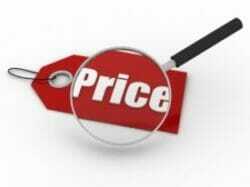 Cost is a consideration for most people. The sales page on the Snore Medic website doesn’t show exactly how much their mouth guard costs. In order to determine this, you must first add their product to your shopping cart and then check out. As of the time of this writing, the price for one device is $39.99 USD. Shipping is an additional $3.95 for standard shipping and $7.95 USD for expedited shipping. Total cost delivered to your doorstep is $43.94 USD if you choose standard shipping. Transit times for standard shipping is 4-7 business days while expedited shipping typically takes 2-3 business days. The Snore Medic is currently available to US residents only. The Snore Medic is priced lower than average in comparison to similar MAD’s. All anti-snoring devices have a limited useful life as plastics begin to break down and they lose their effectiveness. According to the manufacturer’s website, this product should last for eight to fifteen months. Similar products have an average lifespan of 12-24 months, meaning that the Snore Medic falls somewhere in the average range. The amount of time that it lasts greatly depends on your sleeping habits and how well you care for your mouthpiece. If you tend to grind your teeth while asleep, you will likely have to replace your mouthpiece within a year or less. The company does offer a subscription-based service where you will receive a new device every eight months at a discounted rate. They mention signing up for such a program, although I was unable to find an area on their site where you are able to do so. Is the Snore Medic Cleared by the FDA? In the United States, the FDA regulates the sale of anti-snoring devices such as the Snore Medic. Before being sold, such products must first be cleared by the FDA. Most manufacturers are able to meet this requirement by claiming that their product is “substantially equivalent” to another product that is currently on the market. The process of obtaining clearance is often lengthy and costly. For these reasons, many sellers choose not to do so. When reviewing a product, I always check the FDA clearance status. The Snore Medic website does not suggest that their product has been cleared by the FDA nor could I find any record when searching the premarket notification database on the FDA website. Is it BPA and Latex Free? It’s also a good idea to know whether or not a mouth guard is BPA or Latex free. This is especially important if you have a latex allergy. BPA’s, on the other hand, are still widely used, although some like to avoid them when possible due to controversial health problems associated with the synthetic compound. After combing through their website, I was unable to locate any information indicating whether or not the SnoreMedic contains BPA or latex. If you have a latex allergy or have concerns about BPA, it may be a good idea to contact the seller and ask these questions prior to placing an order. When examining a product, I always like to browse the seller’s site as well as the internet to find what others are saying. The Snore Medic website does offer about a dozen reviews touting their customer service and success with their product. All reviews were five star, except for one which was rated at four stars. 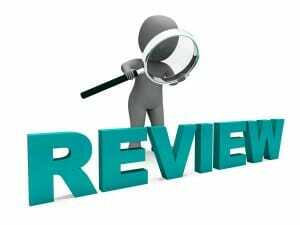 Naturally, I always take reviews posted on a sales page with a grain of salt, so I tend to search for reviews left on 3rd party websites such as Amazon. My search turned up empty-handed as there was no listing for this product on Amazon or elsewhere and only one other product review which did not go into great detail. The lack of reviews is likely due to the fact that the Snore Medic is a relatively new product that was recently introduced. After placing my order, the Snore Medic quickly arrived and I was ready to get started. All expected items were neatly contained within a small box. The instructions were clear and easy to follow, which made the fitting quite simple. The process was very easy and involved heating the mouthpiece in hot water for several seconds prior to removing and placing into the mouth. When inside the mouth, you must bite down firmly to get a good impression while keeping the jaw in a slightly forward position. Once the mouthpiece has had a chance to set up for a few seconds, remove and place into cold water to allow it to set before removing the air hole plug. I had created a custom impression of my teeth in just a few minutes and the Snore Medic was ready to roll. The experience of using the Snore Medic was just like any other MAD that I have tried in the past. You simply place it inside of your mouth prior to going to bed. Upon awakening, clean and store the mouthpiece. I found the fit of the Snore Medic to be okay. It wasn’t the thinnest mouthpiece that I have used, neither was it the thickest. Because of the size, it was noticeable yet still tolerable. The thermoplastic material that’s used offers a decent fit. While inserted, it held my jaw forward as it’s intended to do. So, did it work? Did it stop my snoring? The answer is YES! It worked as advertised although I did drool a bit during the first couple days of use. This is a side effect that is common with all MAD’s so it’s nothing that should alarm you. I found the Snore Medic to be an inexpensive, no frills mouthpiece that effectively stopped my snoring. It features 2 decent size air holes which are great for mouth breathing. For just over $40, it’s a fairly good value for a basic mouthpiece. There are however other mouthguards that are available that cost a few dollars more but are more compact and offer better features such as a tighter fit and the ability to make an adjustment. Overall, this is a product that I would recommend for those on a budget, as it’s a good introduction to snoring mouth guards. To conclude this review, I’m going to summarize my findings with a short list of pros and cons that I found while testing out the Snore Medic. Previous post: Married Couples who Sleep in Separate Bedrooms because of Snoring – What can be done?